Shirdi Sai Baba Devotee Pavithra Kapa From Canada Says: Sai Ram, My name is Pavithra, I am a member of Mahaparayan group 87-Canada. I am indeed blessed to be part of this. I wish you all guys part of this noble work, loads of happiness because you are giving people the pure bliss in the form of Baba’s parayan. I am living in Canada from 2015, I am part of MahaParayan (MP-87) group, and Sai has been part of our family from my childhood. My Grand Mother and Maasi have been devotees of Baba that’s how I started praying Baba, but childhood was not the time I came closer to Baba, it was just an year before marriage I came much closer to Baba. We are not financially strong and my mom is the one who takes all the responsibilities of the home. I visited Shirdi in Feb 2014 for the first time and was very happy. After that I was placed in a small company, with my salary I could just support myself by not depending on mom but my mom was worried about my marriage because there were no savings. In September 2014 I got married to a guy in our relations and the they took over all the expenses for the marriage. I couldn’t help but think what in the world that I did that Baba was so loving and generous towards me to give me such a good human being as husband, my mom’s biggest tension was relieved as if it was nothing. After I moved to Canada with my husband, I started searching for jobs but it was very hard to get one. But finally in Aug 2015 I was to join the job but just before 2 days the project was cancelled and I was very upset. But deep in heart I was thinking there was something big behind this which Baba will reveal later. That is the time my husband desperately started searching jobs because we both had our own responsibilities towards our family. During those times we met a person who said he would refer for a job in his company, which he did and my husband did attend the interview and got job. In January 2017 we moved to the city and He joined the job. The guy who introduced us to new people also helped us in finding a place in the city. We were introduced to a friend by Baba’s grace when we were going to Baba’s aarti every Thursday and we had so much gratitude for the friend who helped us in all this. There is a saying forget the good you did to others but not the good others did to you. Now the real problem started he started dominating my husband in the work. He would misunderstand every small situation and my husband used to go talk to him explain him again, it went on all year. There were lots of things which I really cannot explain here. It was taking toll on our relation because of the stress at work. Every time something happened we used to think it was some stress, although we were not sure what stress he had and used to adjust. He also started doing 2nd job. All the work was managed by my husband. Two months while he was on the 2nd job still he blamed my husband that he did not call him every day and update him in spite of all the work he was handling. I got job in Aug 2017 by Baba’s grace, all this was happening in our life, we were not sure what went wrong in handling a good relationship. All this time we adjusted but nothing cannot be beyond self-respect. He started disrespecting my husband and He couldn’t tolerate enough. He thought to resign without a job in hand. We put chits in front of Baba and told Him that it is up to You and we will remain with the decision You make for us. We took one chit, it said resign. So next morning was a Thursday so I got up early, did Pooja and was telling Baba to give one indication that we were doing the right thing. Then we got a call from uncle. 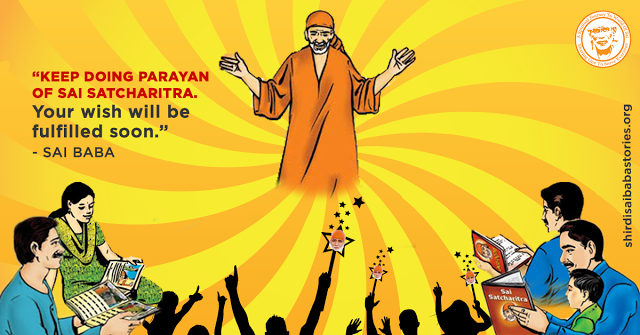 He is a great devotee of Baba and knew the situation that we were facing. As soon as my husband told that he was going to put down his papers, he said go ahead if you need money I am here to give and I couldn’t control my tears because I was waiting for an indication and here it came. So my husband went and put down the paper and next day he had an interview with other company. See Baba’s miracle; in 3 hours they got back, telling him that he was selected for the job and the pay scale was more than what he was getting before. We were never concerned about the pay but needed some peace in life. All this happened after starting Mahaparayan. I am very thankful to Baba for I do not know what life would be without Baba, as I told we are now able to help our parents financially and our families are getting into place. Thank You Baba for being in our life and I thank everyone who took in the responsibility for this great work. All I would say is have constant firm faith and patience on Baba, He will help you cross all the obstacles, but do what your responsibility is and leave rest to Baba. I am sorry for the long post but it helps me be closer to Baba. Akilanda Koti Bramhanda Nayaka Rajadhi Raja Yogi . Why fear when Baba is there, blessing and guiding us at each step. None can equal His love and concern for the upliftment of His devotees. The most important thing is that Baba never lets down His children. Love You Sai Maa. Jai Ho Sai.